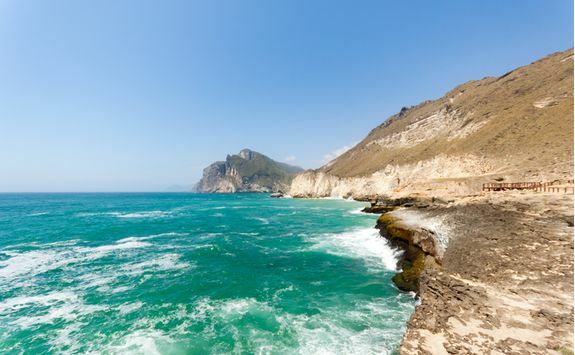 This 15-day tour is a fantastic fusion of glorious locations for the perfect romantic getaway. 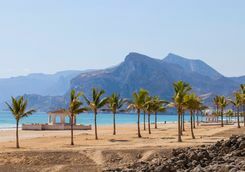 Enjoy a stay in a luxury beach hotel in Muscat, a beachfront private camp in Salalah, glamping under desert stars and finally in a superb villa facing the Persian Gulf in the Musandam Peninsula. 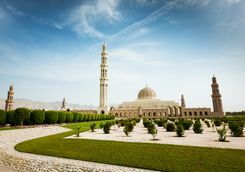 Sadly we can't arrange a magic carpet ride, but board your flight in London and you'll be winging your away overnight to the romantic destination of Muscat in Oman. It's a seven-and-a-half-hour journey, so if you're too excited to sleep, we recommend making sure the iPad is fully charged and filled with the latest box sets. 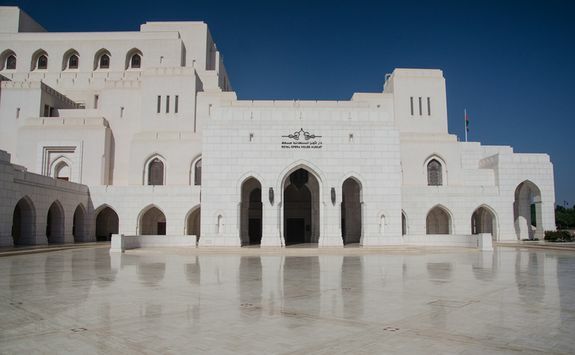 On arrival in the morning, our driver will be waiting to welcome you at Muscat Airport. 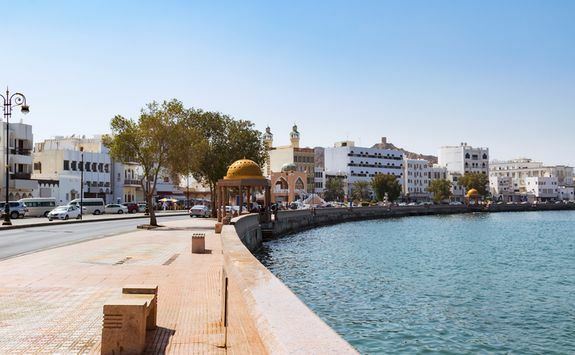 You will then be transferred in an air-conditioned vehicle between 30 minutes and an hour (depending on which best suits your requirements) to your superb luxurious beach front hotel which will be your home for the first three nights of your stay. Once at the hotel, where early check-in has been arranged, you'll have time to relax and unpack before lunch. 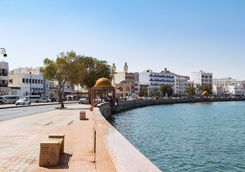 The afternoon is yours to enjoy either within the sumptuous surroundings of the hotel or to go out for a preliminary exploration of the local area. Enjoy some Ayurvedic spa therapy with a abhyanga massage. 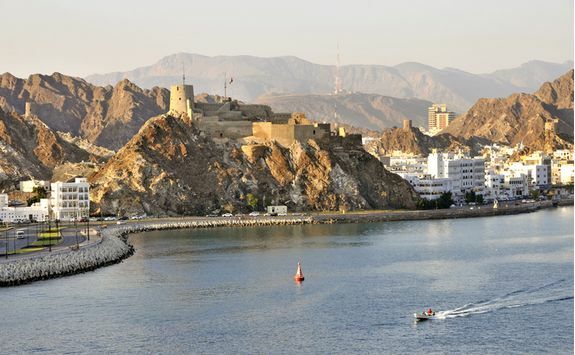 Visit the Al Jalali Fort in Old Muscat Harbour. Spend the afternoon together on the beach. 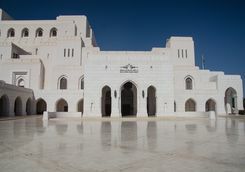 After an early breakfast, you'll leave the hotel for a fascinating half day guided tour of Muscat. 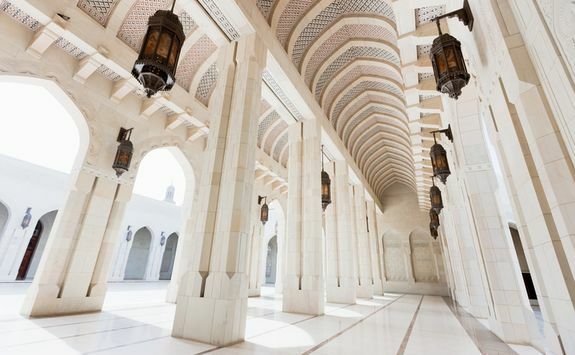 Start the tour at the iconic Sultan Qaboos Grand Mosque as the early morning sun glints off its golden dome before exploring the fort-like grandeur of Muscat's Royal Opera House. 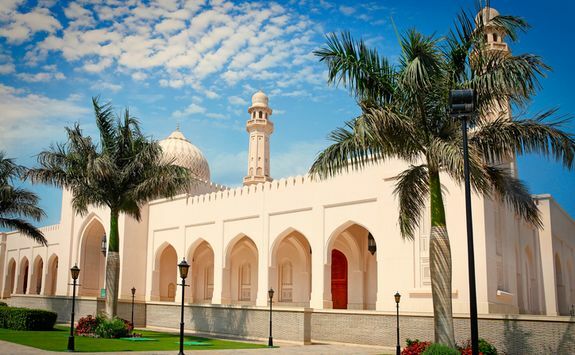 On a visit to the Bait Al Zubair Museum you'll see the richness of the Omani artefacts housed there, and the diversity of the art hung in its galleries. 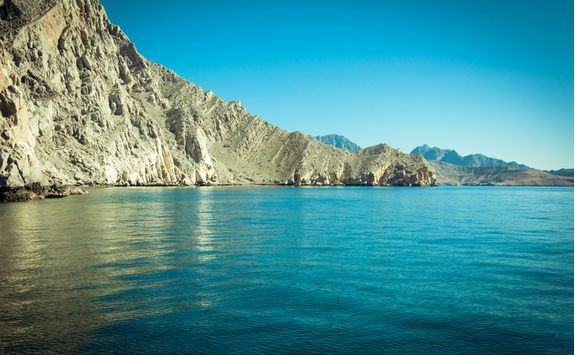 Later, after an engaging sortie through bustling Mutrah Souq, you'll get a breath of sea air when you wander back to the coast and Port Sultan Qaboos, where traditional fishing vessels bob alongside giant megayachts, including the Sultan's. Spend this afternoon by the pool or beach, or enjoying other activities that we can arrange. Charter a boat for a private afternoon sailing. Get in a round of golf at either of the two 18-hole championship courses nearby. 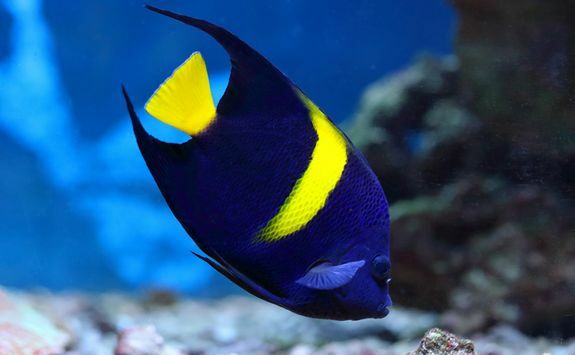 Snorkel over a nearby reef. This morning your boat will be waiting for you in the harbour. 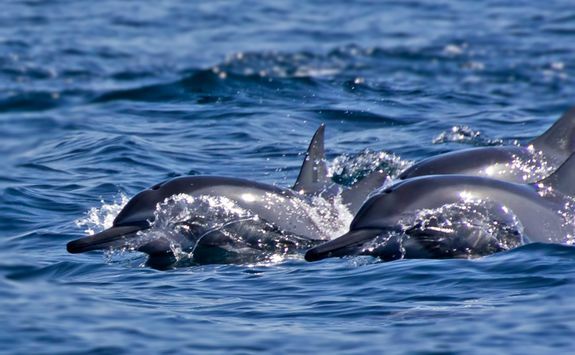 Once out at sea, you'll go in search of most people's favourite marine mammal - the dolphin. Keep your eyes peeled for the first sign of a sleek, grey body emerging from the waves. 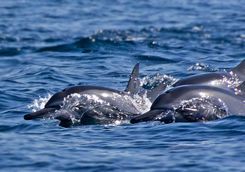 The skipper and crew are on spotter duty, and can identify our cetacean cousins swimming alongside (most likely close enough for that perfect Insta-snap) as spinner or bottlenose dolphins. After an exhilarating morning, this afternoon is yours to do with as you please. In the evening, we have reserved a special table for you at The Beach Restaurant at the beautiful Chedi Hotel. 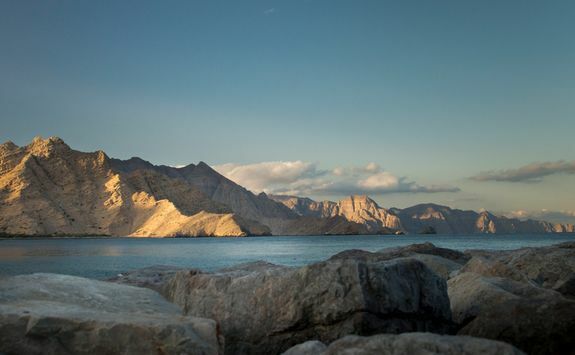 You'll dine on exquisitely prepared seafood accompanied with first class wine on a moonlit terrace overlooking the Gulf of Oman. 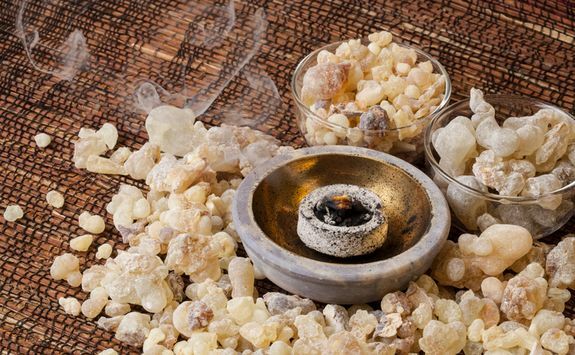 Indulge in some Ayurvedic Spa therapy. 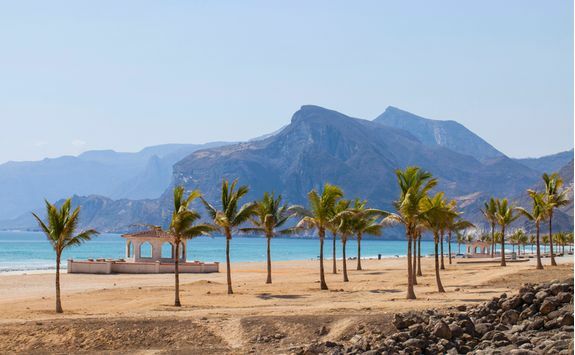 Today you'll be taking a short domestic flight from Muscat to Salalah, the capital of Oman's Dhofar region. It's an early start so a packed breakfast will be waiting for you when the transport arrives to take you to the airport. 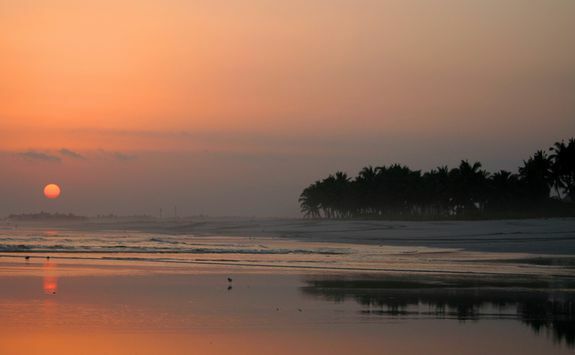 In just under two hours, you'll land in sub-tropical Salalah, then be driven along the stunning coastline to your luxurious and secluded beach camp. Once you've had time to settle in to your intimate beach retreat, you'll be served lunch in Bedouin-style majlis (meeting place) right on the shoreline of the Indian Ocean. Spend the afternoon exploring the truly incredible location with a walk along the deserted sands followed by a swim and/or snorkel in the clear azure waters. 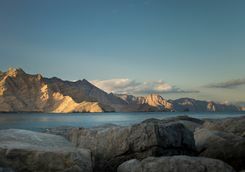 When you're ready for dinner, your personal camp chef will make all the necessary preparations and serve your meal so you can dine, uninterrupted, as the sun sets on the horizon. Wake refreshed from sleeping with the sound of the waves lapping right outside your tent. Take a morning swim and then eat breakfast in the beach majlis. 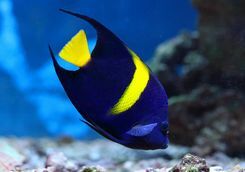 This is a day for you to choose just what you want to do. 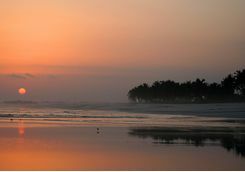 As it's not often in life you get a beach to yourself, you might like to spend it luxuriating in the camp's restful atmosphere and make the most of this private stretch of the Dhofar coastline. 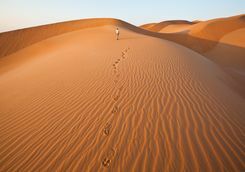 You might decide you'd like to explore your surroundings because there's a lot to discover in the area. 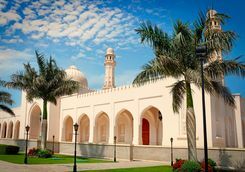 Visit the town of Salalah where you'll find a vibrant open-air fruit market, Salalah's Garden or investigate the busy souq where essential oils such as Frankincense are sold. 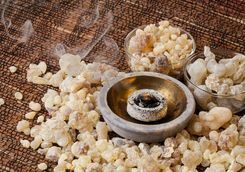 And on the subject of this aromatic resin that was once more valuable than gold, close by the beach camp you'll find the ruins of an ancient Frankincense trading port, Sumhuram, which is now a major archaeological dig and which offers a great insight into ancient Omani life. 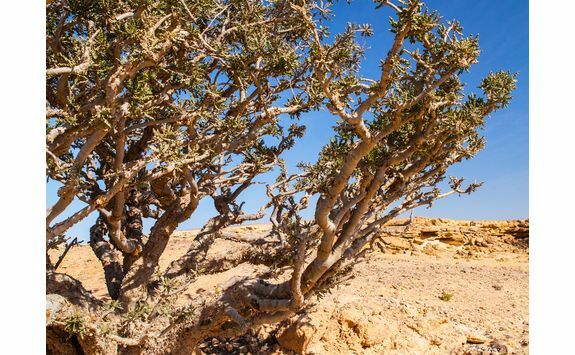 Spot some of the amazing wildlife which populates the Dhofar region. 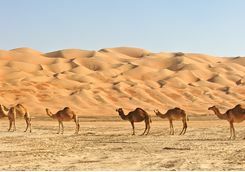 You might like to visit Wadi Darbat, a verdant oasis teeming with bird life such as ospreys, pelican, flamingos and the odd bathing camel or two. Start the day as the sun rises above the horizon. Watch its star-like glimmer on the ocean as you take breakfast and prepare to bid farewell to this idyllic location. 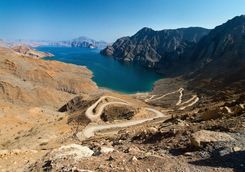 After that, you'll be ready to set off on an adventurous drive along the Darra Ridge and capture some great photos of the contrasting sea and mountain landscape. 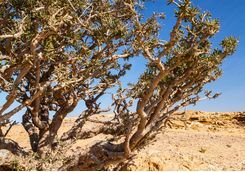 You'll stop for a picnic lunch in what appears to be a wilderness, but which is in fact an area rich with endemic plants and many ancient examples of Boswellia Sacra, the tree from which the sap is harvested to produce precious Frankincense. 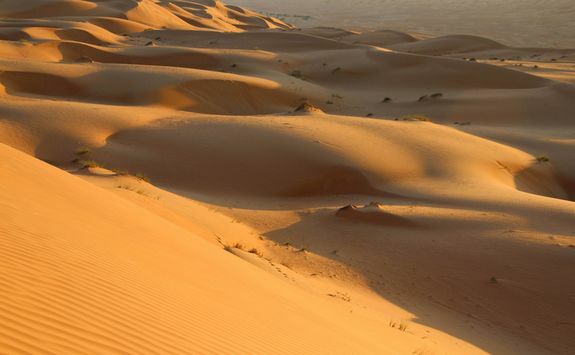 After lunch, you'll wind your way through desert wadis and gorges until you reach the incredible expanse of sweeping ochre sands known as Rub al-Khali, or the Empty Quarter, where the camp has been prepared. 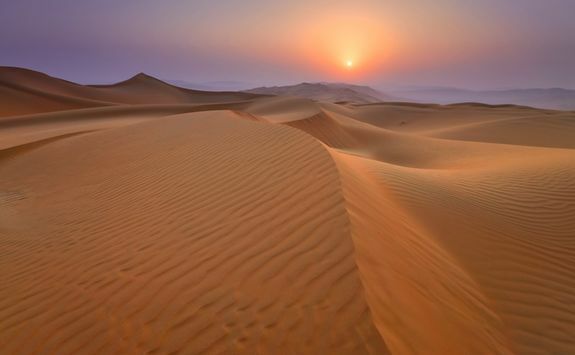 Take time to watch the sun set over the dunes (ideally having walked to the top of one, drink in hand) before enjoying dinner by the flickering light of the camp fire. 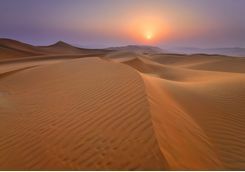 Wake early to view the spectacular sunrise as it bathes the huge dunes on the horizon with golden light. It's the sort of romantic moment you'll remember forever. 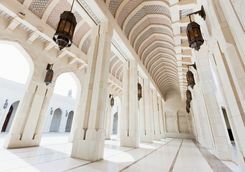 Have a long, relaxed breakfast in the comfortable majlis then spend the day exploring the desert's surprising diversity in a place that Wilfred Thesiger captured so memorably in his famous travel book Arabian Sands. 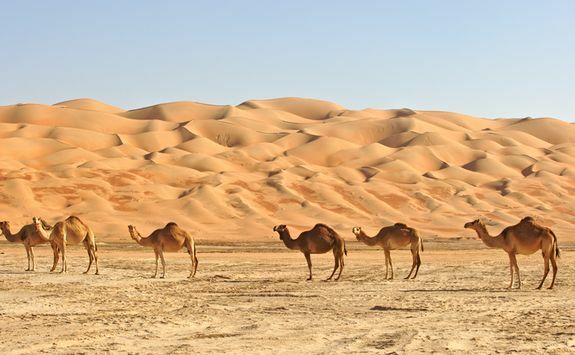 In the early evening a Bedouin from the Haraizi tribe will join the camp, bringing his camels with him, to give a fascinating insight into what has become an almost extinct way of life. 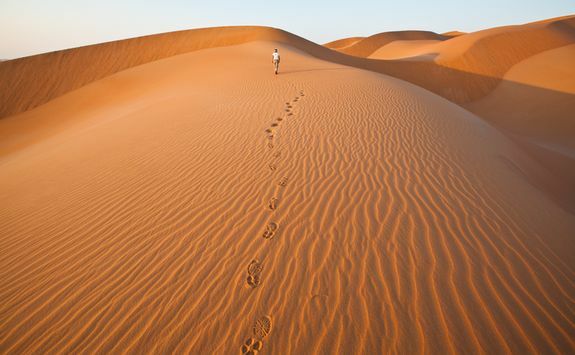 Later, you'll dine under a canopy of desert stars and delight in the supreme tranquillity and remoteness of your incredible surroundings. Build your own impressive sandcastle. 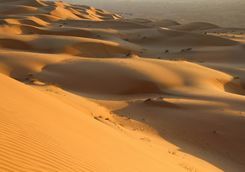 Watch another stunning desert sunrise together before leaving for Al Mazyunah near the Yemeni border and on to Thumrait. 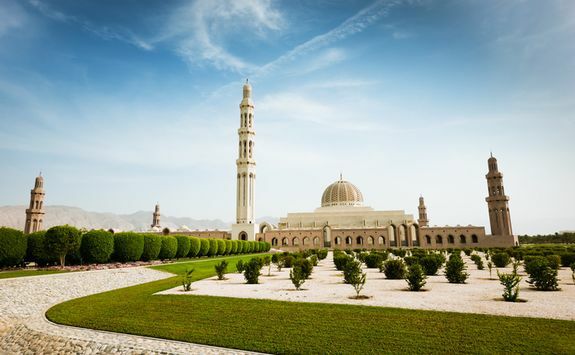 Traverse an amazing cratered landscape scattered with fossils and ancient standing stones before crossing over the mountains and arriving in Salalah in time to board your flight to Muscat, where you'll connect onwards to your one-hour flight to Dubai. 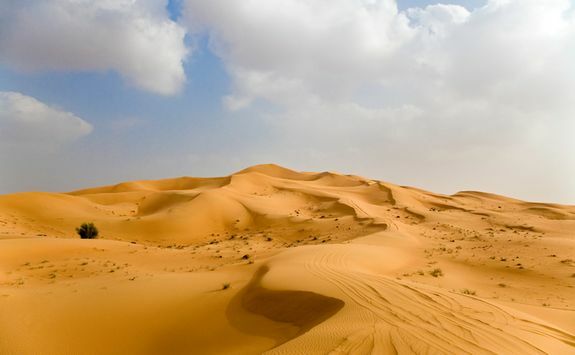 You'll be met at Dubai Airport by your personal driver. 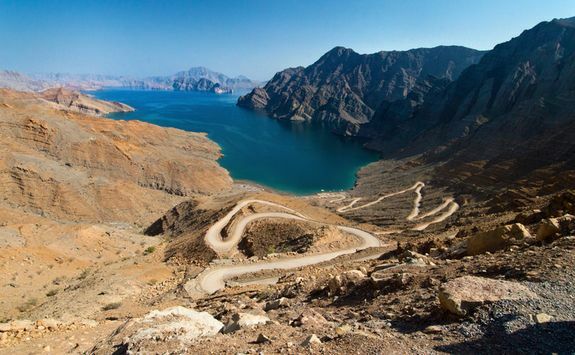 He will chauffeur you on the two-hour journey from the airport to the Musandam Peninsula (an exclave of Oman, but best reached from the UAE) and the luxury beach hotel where they'll be waiting to check you in to your deluxe private villa. Time to rest up, relax and reflect on the wonderful adventure you've just had. 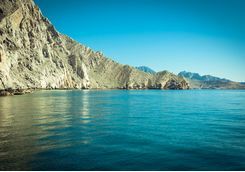 There's a delectable beach and warm turquoise sea and pools to swim in, but this is also somewhere that merits exploration, so over the next few days consider some of the following activities, from paragliding to hiking, snorkelling to diving, and dhow rides to mountain biking. 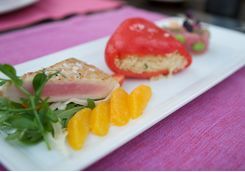 If that all sounds a little, well, active, then you could easily spend a few days relaxing in your entirely private villa, lounging around in the private - and very decent sized - pool and taking in the majestic views from your terrace or veranda. Come evening, drink cocktails under the moonlight right on the shoreline before eating dinner in a restaurant with views of the sea. 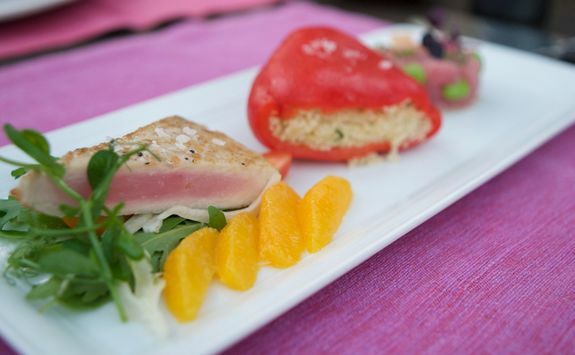 For something even more special, take a private dinner together in the intimacy of your villa, attended by a butler. Experience the soaring thrill of paragliding. Enjoy a final leisurely morning in the luxurious surroundings of your villa before it's time to return home. 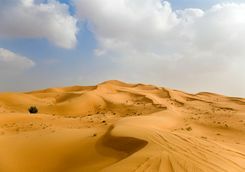 A driver will collect you and transfer you to Dubai Airport (roughly two hours away) where you'll catch your direct flight back to the UK. 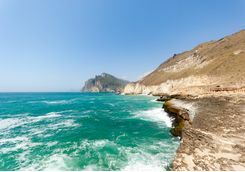 The flight will take approximately eight hours, and depending on which flight you take you will land back in the UK early or late afternoon.